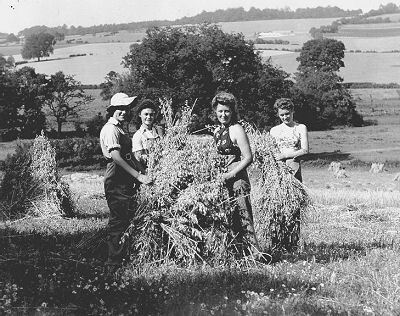 The Women’s Land Army | The Dacorum Heritage Trust Ltd.
DACHT : 62.16.9. Land Girls at the wedding of Bill Cutler and Barbara Laplain,DACHT : 62.16.9. 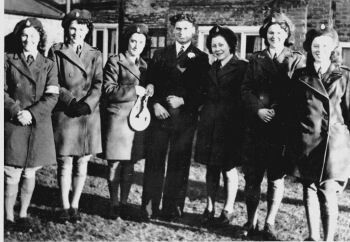 Land Girls at the wedding of Bill Cutler and Barbara Laplain, who was a Land Girl from Enfield. who was a Land Girl from Enfield. DACHT : 62.16.10. 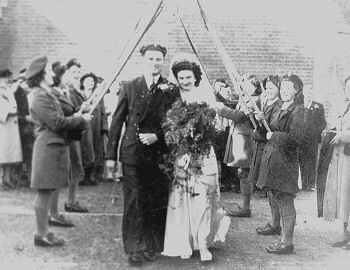 The wedding was at St John’s Church, Markyate and the arch of pitchforks was made by fellow Land Girls. DACHT : 62.16.7. Land Girls helping with the harvest at Piccotts End. Many of the young men who had worked on farms prior to the war had left their jobs in order to join the services. It was vital that farms should produce as much food as possible and so the Government established the Land Army. 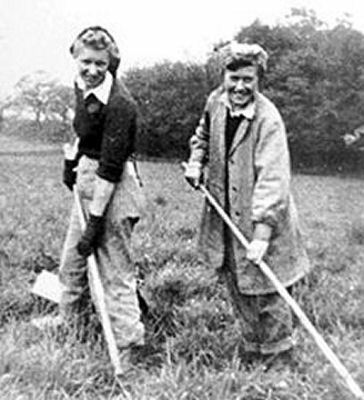 Women were encouraged to join the Women’s Land Army and become Land Girls. They were given a uniform and taught everything from harvesting crops and looking after animals, to ploughing and driving tractors. Hostels were established for accommodation at Barnes Lodge (Kings Langley), Pendley Manor and Little Gaddesden, which had 34 girls from Yorkshire billeted there in 1942.